For the month of November 2015, Prof. Papa Samba Diop will join the IRTG Diversity as Visiting Professor at Saarland University (see http://irtg-diversity.com/index.php?page=people&relation=visiting_scholars). 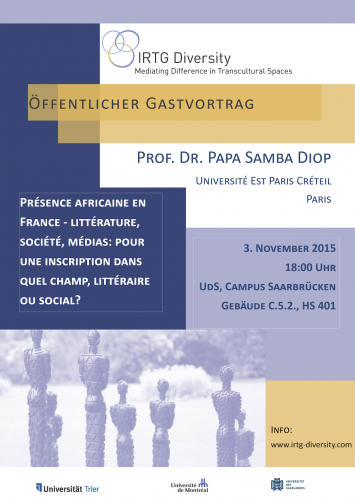 Papa Samba Diop is professor of Francophone Literature at the University U.P.E.C. (France) and will give four guest lectures during his stay in Saarbrücken. The title of his first talk is: "Présence africaine en France - littérature, société, médias: pour une inscription dans quel champ, littéraire ou social?" and it will take place on November 3, at 18:00h (UdS, Gebäude C.5.2., HS 401).